Yesterday, Boom! 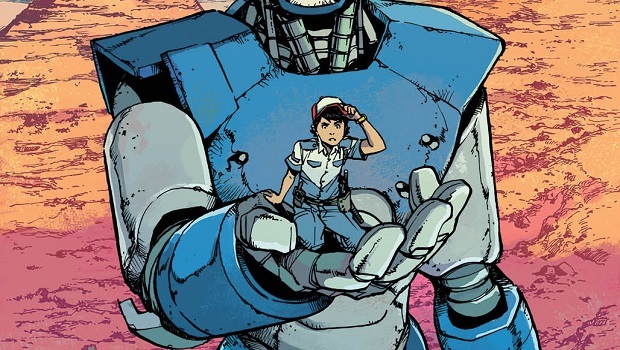 Studios announced Mech Cadet Yu, a new comic featuring a collaboration with Greg Pak (The Incredible Hulk, War Machine) and Takeshi Miyazawa (Ms. Marvel, Runaways). The comic will be released in stores and digitally this August. Mech Cadet Yu follows Stanford Yu, a janitor who suddenly is chosen to join the ranks of mech cadets at Sky Corps Academy. Once a year, robots from outer space bond with cadets in order to defend the world from the Sharg, aliens from an unknown place. After Yu unintentionally bonds with a robot, he is thrown into training in order to prove his worth in the academy. Pak and Miyazawa have worked on projects together in the past, and have been widely known to have created Amadeus Cho, an Asian-American character who has recently taken up the Hulk mantle in Totally Awesome Hulk. Mech Cadet Yu will be available in comic shops and digitally through ComiXology and the Boom! Studios app this August. Stay tuned for more news here on Gaming Trend.